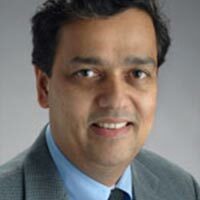 Medical oncologist Dr. Prakash Neupane is director of the Hematology Program and the Head and Neck Program at the University of Kansas Medical Center. Neupane also is a member of the site-specific lung cancer team that reviews and treats patients with pleural mesothelioma, the rare and aggressive cancer caused by asbestos exposure. Neupane joined the University of Kansas Medical Center in 2008, working into a leadership role that has allowed him to focus on head and neck cancers and thoracic oncology. The lung cancer site-specific team promotes a multidisciplinary approach to treatment, allowing each patient to receive opinions from surgeons, oncologists, radiologists, researchers and cancer psychologists. All work together with different areas of expertise in the same malignancy. The University of Kansas Medical Center also has site-specific teams for breast cancer, gastrointestinal cancer, melanoma and sarcoma, genitourinary cancers and head and neck cancers. The teams develop comprehensive cancer care services that guide patients from initial screening through survivorship. Neupane also is involved with military veterans through his affiliation with the Kansas City VA Medical Center. He is an associate professor of medicine at the University of Kansas and is board certified in medical oncology, internal medicine and hematology. Neupane spends considerable time conducting clinical research and is involved in the American Society of Clinical Oncology (ASCO) International Programs, which trains oncologists in low-resource countries. After graduating from medical school at Tribhuvan University in Nepal, he did his fellowship at Louisiana State University and his residency at St. Barnabas Hospital in New York City. Disclaimer: Dr. Prakash Neupane has no professional affiliation with Asbestos.com. University of Kansas Medical Center. (n.d.). Medical Oncology, Prakash Neupane, MD.